Night of Fire is another album I picked up while in Japan. before the trip I had been listening to the first Shipyards album About Lights quite a bit. If you read the review I did of that album, you'll know that I absolutely loved it. While in Japan, I really wanted to make sure I grabbed whatever else of theirs I could find and the first off that list was their debut full length Night of Fire. In many ways Night of Fire is a pretty obvious precursor to About Lights as the two records have a pretty similar sound. 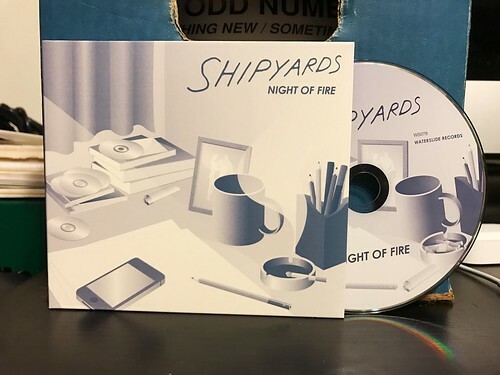 Shipyards is crafting the same sort of super energetic punk rock that made me fall in love with other Japanese punkers like Snatcher or International Jet Set. The strained vocals convey a sense of urgency while the guitar interplay keeps everything sounding fresh and exciting. But of course the real key for me is how catchy these songs are and how I immediately start tapping my foot whenever I put this album on. I really wish I had been able to see Shipyards play when I was in Japan. Their songs contain the sort of infectious energy and sing along choruses that I know would be an absolute blast to see in person. It wasn't to be during my trip in December. I guess that's just another reason why I need to go back to Japan some day. In the meantime, I'll just keep listening to both Shipyards albums on repeat.